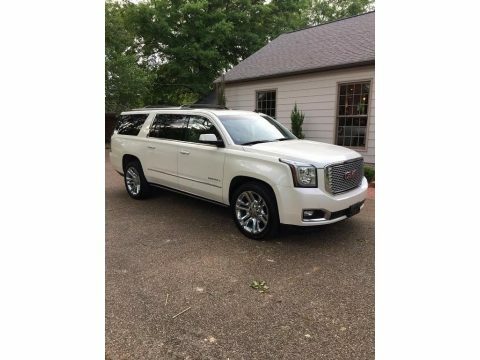 2015 GMC Yukon XL 1500 Denali for sale in Cleveland, MS 38732**PRICE REDUCED BY $25k** Boasting massive space and an upscale cabin, this 2015 GMC Yukon XL Denali shown in Pearl White is perfect for your family. Under the hood is a strong Vortec 6.2 Liter V8 Flex Fuel engine with 420 hp that is tethered to a 6 Speed automatic transmission. Thanks to Active Fuel Management, you'll attain 18 mpg on the open road; and with StabiliTrak, you'll have control to take on whatever the road conditions have in store for you. This rear wheel drive SUV offers spirited acceleration and a smooth, quiet ride with a strong coil-over-shock front suspension and impressive strength you can feel the moment you slip behind the wheel. The aggressive contours of our Denali are accentuated by 20 inch alloy wheels and a power liftgate. With comfortable leather seating for up to 8 passengers, the interior features heated and cooled front seats, heated second-row seats and a heated steering wheel. Remote engine start, navigation, Bluetooth and a great Bose surround sound audio system with digital music storage are just a few of the amenities included in this sturdy SUV. In addition, Yukon has been designed with with a number of advanced safety features to protect you and your loved ones. Air bags from the front to the 3rd row seating, a rearview camera, blind-spot monitoring, parking sensors, anti-lock brakes, and OnStar emergency telematics all provide peace of mind. This SUV is ready to work hard for you while pampering you with a smooth ride and luxurious cabin. Please call 402-502-8385 for additional information.